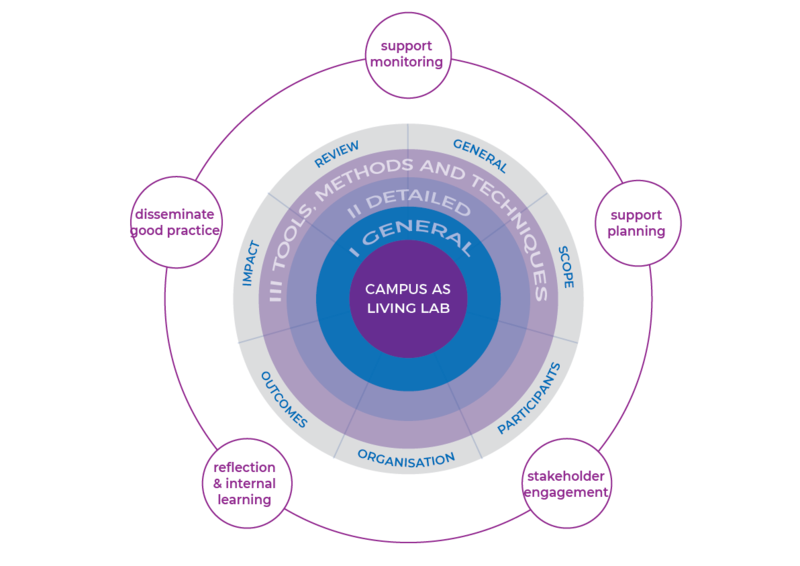 The Campus as Living Lab Framework provides a systematic description of innovation projects combining campus and local/regional sustainability, research mobilisation, student learning, civil society towards societal challenges. The Framework is developed for practitioners setting up or managing Living Labs in and around University Campuses, such as Sustainability Coordination Officers (SCOs). Initial Living Labs for Sustainability can be set up and handled as projects, as as they have a beginning and most probably as well a clear end of financial resources but as engagement- and empowerment processes are time consuming processes and are based on trust, they have to be considered as well as continuously ongoing processes. In co-creation meetings ideas have to be developed and research questions defined out of them, with changing participants and stakeholders. With this understanding the once started process has a big potential but demands as well responsible interacting and tailored communication plans to provide and share information with each stakeholder to keep the empowerment process ongoing. The system has seven categories with underlying parameters (both binary and textual). The framework is designed to support the implementation and monitoring of an effective Living Lab learning system, through its six categories of data collection. Depending on the stage of the project or the user of the framework, they may choose to engage with the framework on three different levels, and at three different stages as per list below: Planning, Monitoring, Review. Level I: Overall and basic information about the Living Lab. This assists in the initial description of the Living Lab, including outlining of the ‘problem’ being addressed and the anticipated broad outcomes and user groups. This Level relates to the early part of Stage 1, the Planning stage. Level II: This refers to the collection of more precise information and parameters for the project, including specific outcome metrics, and anticipated numbers from different stakeholder groups. This Level encourages more detailed planning (Stage 1 - Planning), and also more detailed monitoring (Stage 2) and review (Stage 3), considering a greater range of questions and more detailed analysis. Campus as Living Lab © 2018 | Theme: Strong Square by Daniel Verhoef.